Hellbender... very much NOT on the straight and narrow, then. This impression grows even clearer when you hear some of their other common names, like Devil Dog and Mud Devil. The real clincher, however, is Snot Otter. Snot Otter! This is a dark business, dear reader. Keep a tight grip on your soul. And bring a handkerchief. 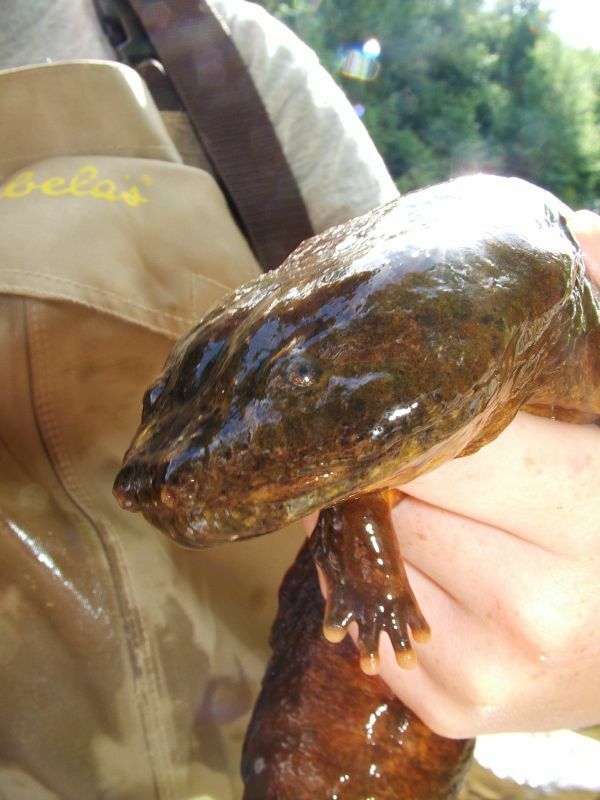 The Hellbender is a great, big, icky salamander found only in the more temperate parts of eastern United States. 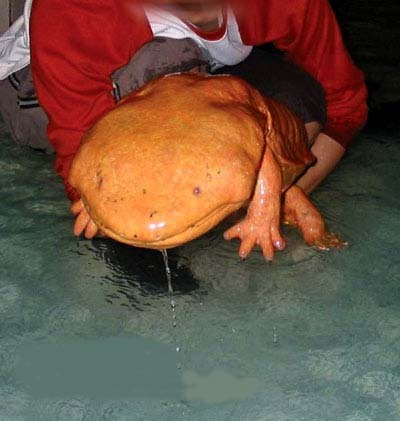 They are the biggest salamanders in North America and the third biggest in the world, dwarfed only by the related Chinese and Japanese Giant Salamanders. They really are dwarfed by those guys, though! 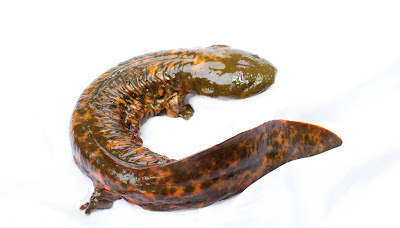 A really big Hellbender is up to 75 cm (30 in) long, while Japanese Giants can double that. Chinese ones are even bigger! It's odd, usually Americans make everything massive and the Japanese make everything tiny. 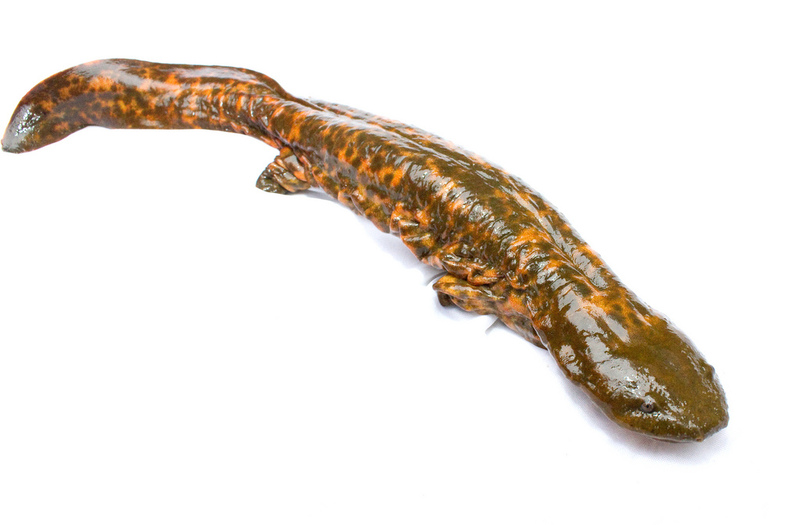 Despite this huge gulf in size, Hellbenders share much in common with their long lost cousins, from the flattened body to the tiny legs and puny eyes. I don't know what you'd expect something called a "Devil Dog" to do, but it's evident that this one won't be chasing after you like a greyhound. Maybe a dachshund, but definitely not a greyhound. Walk briskly and you should be fine. One interesting difference from the other Giant Salamanders is that Hellbenders don't like to raise their little nostrils up out of the water to take in a lungful of air. They much prefer to keep completely submerged at all times, taking all the oxygen they need by absorbing it through the wrinkly frills of skin that run down their sides. This leads to extremely precise habitat requirements to ensure they aren't constantly out of breath. Cool, shallow, fast-flowing rivers are a must for Hellbenders. Which doesn't sound Hellish at all! Sounds rather pleasant in fact, especially when their flattened body shape ensures they don't get swept away in the current. Also, they don't even like mud that much! 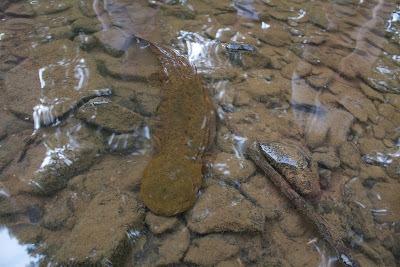 Hellbenders prefer an assortment of stones beneath their feet and perhaps a few more to hide under. When they get hungry, Hellbenders follow their nose to sniff out crayfish and small fish to eat. They have poor eyesight and sometimes you have to take a close look see that they have eyes at all. When the breeding season comes around, the males have a lot of work to do. 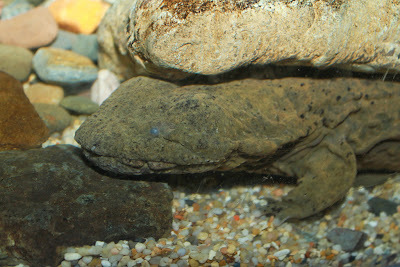 He first excavates a nest under a rock or log and then waits around until a female wanders by. When he spots (or smells, I suppose) her, he'll jump out and try and guide her, steer her, drive her or otherwise get her to his den. Then he'll basically stand there waiting for her to lay a couple hundred eggs so he can fertilize them as they fall. With that over, he now kicks the female out and sends her packing. 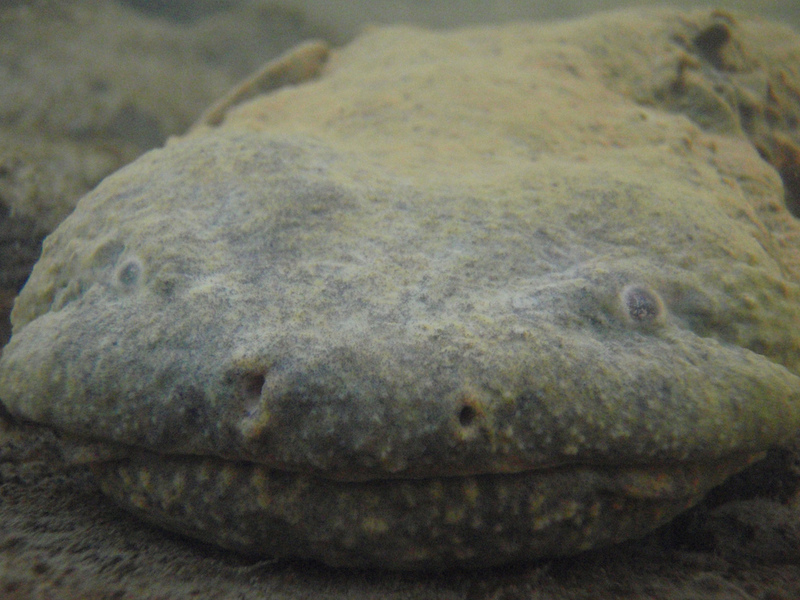 For the next month or two he guards the eggs from predators, not least other Hellbenders. He even undulates those wrinkly frills of skin on his sides to waft water over the eggs and ensure they're supplied with sufficient oxygen. 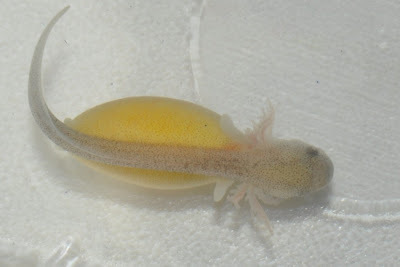 When the incubation period is finally over, the eggs hatch and tiny, 2.5 cm (1 inch) long Hellbenders crawl out and start their life. Each one has a yolk sac that provides them with food for their first few months and they breathe using external gills that will remain with them for some 18 months. It won't be until they're a whopping 5 years of age that they'll be able to have youngsters of their own and captive individuals were dead by the time they were 30, at which point they were slimy, wrinkly and had eyes that were kinda glazed over. Now that's rock 'n' roll! 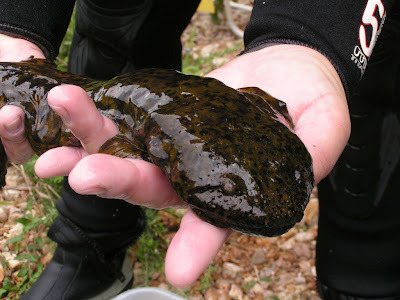 All in all, the Hellbender seems really strange to me. 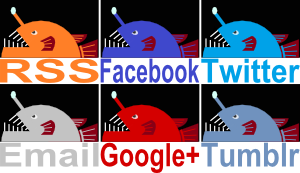 When I look at it, I imagine it creeping along in the mud of some swamp or stagnant pond. As it turns out, they're more like a terrifying testament to the value of clean living. (your comment on the bird feeder made me laugh today). You gotta love names like that! They just roll off the tongue and are so descriptive. I'm delighted by snot otter. What a wonderful name. @Jedediah: It's great that you're so keen to check out those slimy salamanders! I hope you get your wish soon and the snot feels appropriately weird! @Crunchy: That's just what I thought! How does a scorpion eat a lion?